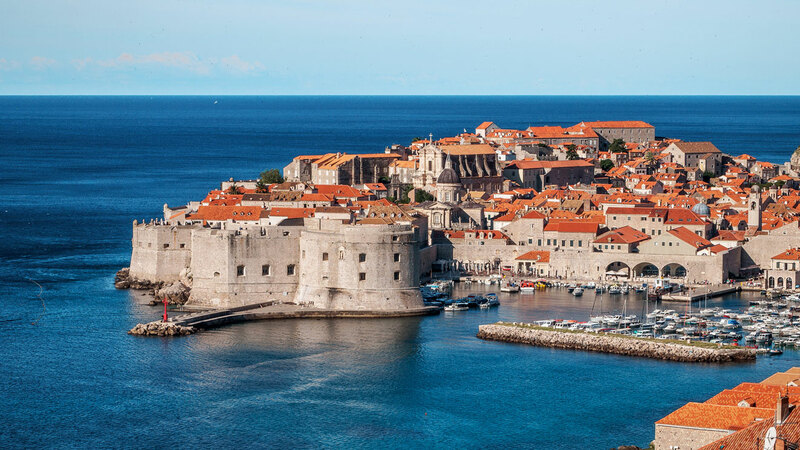 The city of Dubrovnik is one of the favorites among those traveling to Croatia. And there’s a lot of reason for that! It is not everywhere that you find a medieval city so well preserved, with practically intact walls. In addition to Dubrovnik’s stunning history, the city is bathed by the beautiful Adriatic Sea. A perfect union of history with natural beauties, great beaches, and delicious food. Dubrovnik is considered a World Heritage Site by UNESCO due to the incredible well-preserved city Walls. Restaurants, cafes, bars and local shops are always the best choice. The city has a super infrastructure and is a great spot for those who wish to make day trips around the region. The Pearl of the Adriatic is located on the coast of Dalmatia, in Croatia. 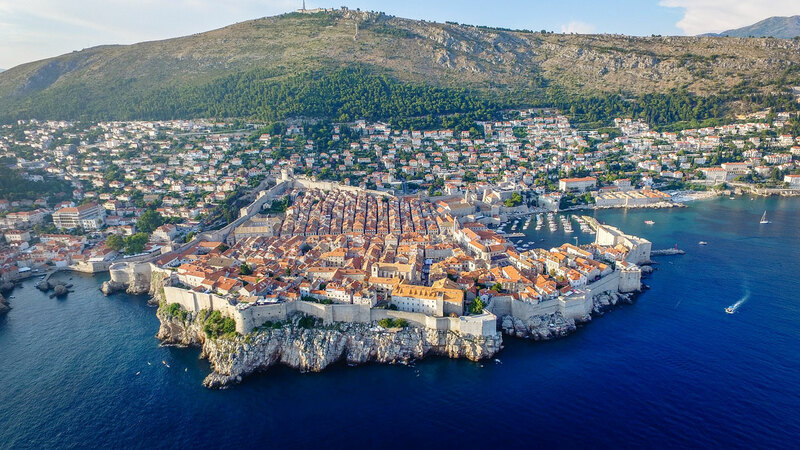 The main point in the city is the medieval town, the walled city or King’s Landing, right on the edge of the Adriatic Sea. The walls date back to the 16th century and are among the best preserved in the world. The entrance to the walled city is free and the best way to visit it is to get lost inside. There are two main gates in the city: Pile and Ploče. Entering into Pile you will be at the beginning of Stradun, the city’s “boardwalk”. To the left is the Franciscan Church with the bell tower and the Monastery. The whole complex is formed by a monastery, a church, a library and a pharmacy. 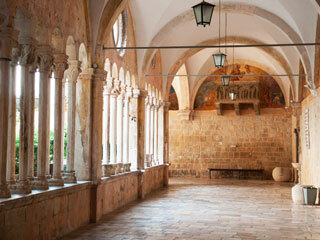 The library of the Franciscan monastery has 30.000 volumes and 1.500 valuable manuscript documents. The Pharmacy is the oldest in Europe, still in business. In this pharmacy, there are common remedies, but there are also products with millennial recipes, made by the monks. It is common to find large queues of tourists – mainly Asian – buying the miraculous creams for wrinkles, cellulite, face, and body. If it works I don’t know, but it does not hurt to try, does it? Both sides of the Stradun have fifteenth-century fountains, but the most famous is the Onofrio Big Fountain. Over there, during the summer, everyone fills the water bottles and enjoy the priceless shade. Continuing through Stradun you will notice a similar and very characteristic architecture. This is because all the houses of the seventeenth century that make up the Stradun have the same pattern of construction. The ground floor level always housed a shop with an entrance to the street with a door and a window. A storage room is in the back with an entrance through a separate alley. The first floor was reserved for the living room and the second floor housed the bedrooms. The kitchen was generally above the second floor to avoid fires. Today at Stradun you will still find most shops on the sea level. Souvenir shops, bakeries, gift shops, restaurants and local products shops. But most of the locals today have already left because of the number of tourists visiting the city. It is not very easy to have a common life when you are surrounded by tourists everywhere, every day. So most of the people today rent their homes for tourists and visitors. And this is awesome if you are looking to stay in the walled city and don’t care about renting apartments or rooms. Within the medieval city, there are very few hotels due to space constraints. But you can find some, mostly boutique hotels. One of the best known is the Boutique Hotel Stari Grad 4*. Another cool place within the walls is the Dominus Little Palace. An old palace that has been restored and today serves as accommodation. But I’ can assure you, if you want to stay inside the walls, prepare your pocket! At the end of Stradun is the Rector’s Palace a Gothic-Renaissance structure that houses a museum. On it’s side is the Church of St. Blaise. 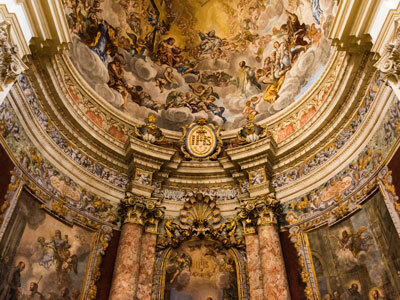 The church was built in the 18th century in honor of the patron saint of the city. The bell tower on the other side of the Stradun is 31 meters high and was built in 1444. 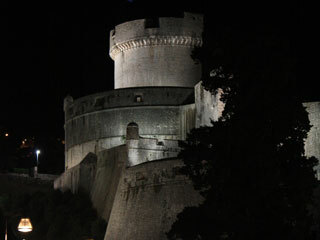 The building is one of the symbols of the free state of Dubrovnik, ancient Ragusa. The steeple was built by local architects Grubačević, Utišenović, and Radončić. 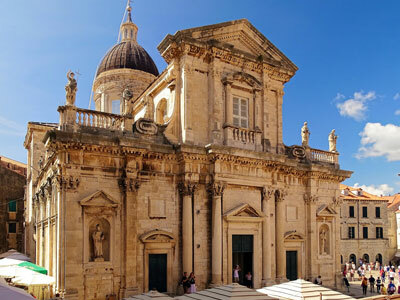 One of the most photographed domes of the city is the Cathedral of the Assumption, the diocese of Dubrovnik. The cathedral still has important relics of St Blaise. Besides getting lost inside the walled city, a must-see is climbing the walls. You pay 150 kunas (+/- U$ 25,00) to enter, but worth every penny. It is from the walls that you will be able to have the most unforgettable view of the city. The complete route of the walls is 1.940 meters and you can visit it all. The whole path takes about 2 hours, always on foot. But for those who can not complete the entire length of the walls, it is also possible to descend in the middle. The main wall is 4 to 6 meters thick, and the narrowest part, on the seaside, is 1.5 to 3 meters thick. The height of the walls reaches up to 25 meters in some points. The landside of the wall is still protected by an additional steep wall as a form of defense against artillery. The western end of the city is also protected from the danger of the sea and land by the Fortress Lovrijenac. More information and history here. Another must see in the city is the cable car ride. Upstairs you will have one of the most beautiful views of the walled city. I recommend you first explore the medieval town and then climb up. I think it’s cool for you to climb up and be able to recognize the places you’ve visited from up there. It’s like looking at a full-size model. The price is 140kn (+/- U$ 23,00) round trip or 85kn (+/- U$ 14,00) one way. If you are in the mood, is worth going up with the cable car and down on foot. You can check more information here. 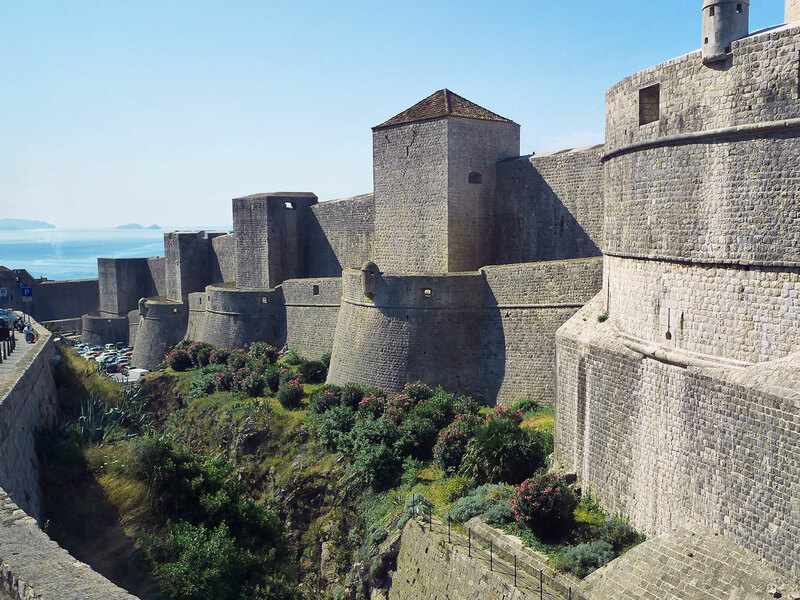 The city of Dubrovnik became internationally known as King’s Landing. Due to the famous Game of Thrones (GOT) series, hosted by HBO. Dubrovnik was used as one of the main locations for the series that transports the plot of George R. R.Martin to the small screens. Those who visit the walled city will have the opportunity to visit the actual locations that were used in the recordings. In a few places is also possible to reproduce some scenes. Besides the walled city, Fort Lovrijenac, Lokrum Island, and Trsteno Arboretum were also used for filming. 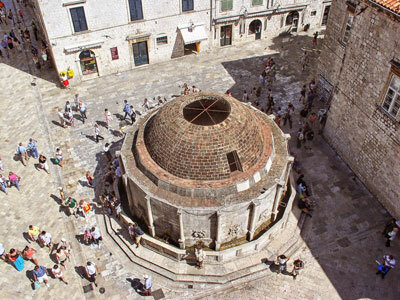 Game of Thrones was also recorded in the Diocletian’s Palace, in Split. In Kliss Fortress, near Split; and in the old city of Šibenik. If you are a super fan of the series you can make a special city tour of Game of Thrones. It will focus on the curiosities, locations, and stories of the series. 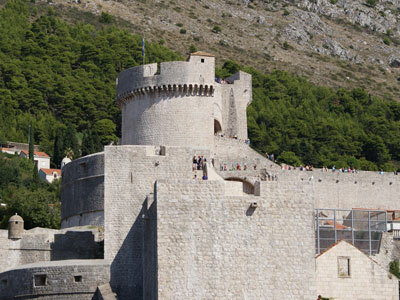 Recently Dubrovnik has been the main setting for several movies, series and television programs. Besides Game of Thrones, the city also received in 2017 the team of Star Wars. Star Wars Episode VIII was recorded in March in the medieval city. Stradun, Old Port, Rector’s Palace, the ramparts and Banj beach were used as the background of the galaxies. In addition to Game of Thrones and Star Wars, the medieval city is also the scene of the recent Knightfall series and the new Robin Hood movie. Despite being a super touristic city, Dubrovnik does not accept euros or dollars. It is necessary to have the local currency KUNA, to be able to buy anything in the city. Restaurants and shops may even accept international cards. But if it’s cash, you should definitely carry the national currency. Dubrovnik has some options for parties and bars. During the summer, the Stradun teems with live music, shows, and performances. After sunset, visitors begin to arrive in the walled city for dinner. This is when the promoters of the clubs and parties will approach offering the options of the day. Choose yours and have fun! 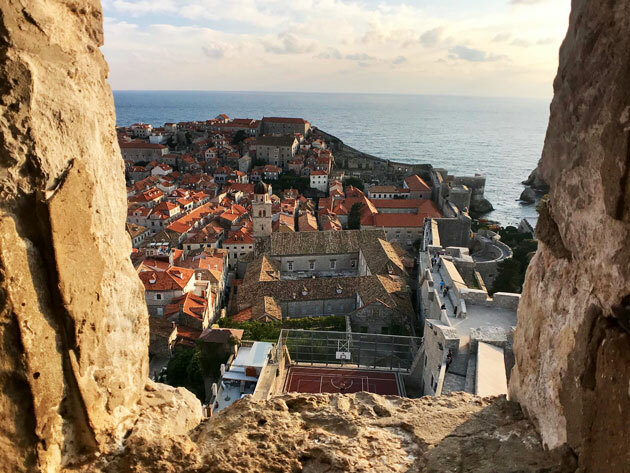 – If you’re on a low budget trip and need to choose between the walls and the Cable Car, I would certainly recommend the Dubrovnik Walls. – Avoid at all costs to visit the walls at noon, especially if it is June, July, and August. The heat will be intense and the climbs and stairs will make you suffer. Take water with you if possible. If not, there are some shops on the ramparts, but the prices will be high. – Keep in mind! The entrance ticket to the walls also gives access to the Fort Lovrijenac. Two for the price of one. 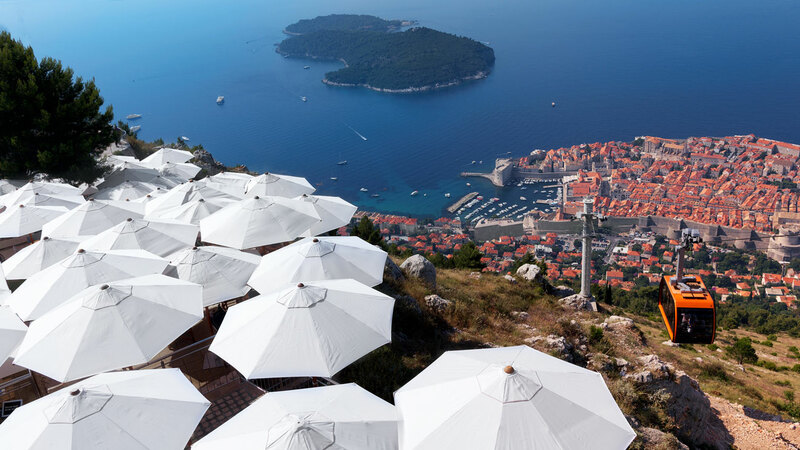 – Dubrovnik is one of the most expensive cities in Croatia. So if you pass through other cities of the country before visiting the Pearl of the Adriatic. I highly recommend that you exchange most of the money you want to spend before. The logic is very simple: the further south of the country, the more expensive it is to change the money. So, if your trip starts in Zagreb, you should already exchange most of the money there. There are various exchange offices in the capital. And then, only if you miss some, change in the coast. Believe me: this tip is worth gold! – I highly recommend you to not do the distance Dubrovnik – Zagreb or Zagreb – Dubrovnik by car, at once. It may seem possible on Google Maps, and it is but is also very, very tiring. The road is extremely monotonous making the driver tired and asleep. Besides that, if it’s summer or high tourist season in the country, the roads will be full and will take even longer than the normal 7h drive. Instead of this unsafe adventure, stop in some of the great cities along the way. Split, Sibenik, Trogir, Zadar, and Mostar are some of the options. 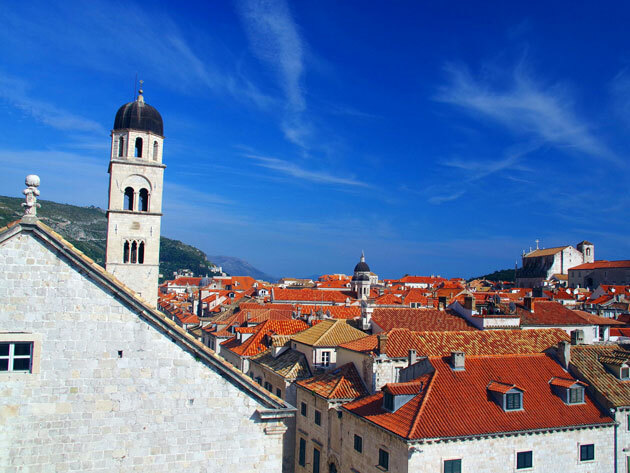 Temperatures in Dubrovnik vary according to the seasons, as in all Croatia. Being on the coast of the country Dubrovnik is, throughout the year, a very humid city. Another factor that drastically affects temperatures in the city are the winds, mainly Bura and Jugo. We have already explained about these famous Croatian winds in this post here. But basically, the Bura is an icy wind that makes the temperatures fall. And the Jugo is a hot and humid wind. During the summer the maximum temperatures in the city reach up to 28 °C. But it is worth remembering that you will be surrounded by thick medieval walls! The nights are coolest, around 23 °C. During spring and fall, seasons of transition, temperatures are more pleasant and not so extreme. Generally, between 20 °C and 28 °C. Winter is not as rigorous as in the rest of the country and it is extremely rare to snow. The lowest temperatures during the New Year period are usually 10 °C. 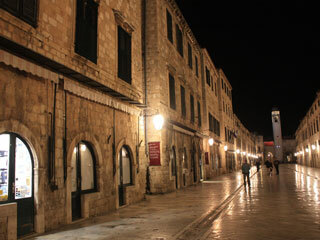 As one of the main tourist attractions in the country, Dubrovnik has several accommodation options. From apartments and rooms that can be rented on sites like Airbnb and Booking.com. To big hotels, boutique hotels, villas, and resorts. Finding accommodation within the walls is the most complicated, especially if you are looking for hotels. Due to the restricted space and the very high price, there are very few hotels in the medieval city. Most of the options are actually apartments and rooms. As already mentioned in the text, the Boutique Hotel Stari Grad 4* is one of the few hotels within the fortified city. It is a 4*, with a few rooms so worth booking in advance and prepare your pocket. Still, within the walls, there is also the Dominus Little Palace. An old palace super well decorated and in a more luxurious standard. The Pucic Palace 5*, is also super luxurious, with lots of room and suite options. There are other options inside the walls, especially of rooms and apartments. But it will require more research. I also highly recommend you to book a lot in advance. Hotels near the walled city are only 5*. 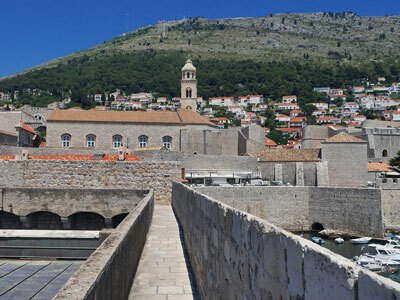 The Hotel Hilton Imperial Dubrovnik 5*, is the closest to the Pile gate, less than 5 minutes walk. Hotel Excelsior 5* is approximately 9 minutes walk from the Ploče gate, also super well located. Hotel Grand Villa Argentina 5* is approximately 10 minutes walk from Ploče gate. Most hotels in the city of Dubrovnik are further away from the walled city but are always accessible by public transport or taxi. Some that are worth checking the availability and price are Hotel Vis 3 *, Hotel Lero 4 *, Hotel Kompas 4 *, Hotel Lapad 4 *, Hotel Neptun Dubrovnik 4 *, Hotel Rixos Libertas 5 *, and Hotel Bellevue 5 *. Besides enjoying the stunning medieval town, Dubrovnik also offers a good rest at the beach. Some of the most known beaches in Dubrovnik are Banje, Sv. Jakov Beach, Lapad Bay beaches (Vis, Adriatic…) and Copacabana Beach. The good news is, doesn’t matter which one you choose, you will always have the blue crystal water. And a Mediterranean atmosphere, just as you dreamed of. Banje Beach, popularly known as the “city beach”, is the closest to the Old Town. So it’s great because you can have easy access, but, on the other hand, it’s also the most crowded one during the summer season. The beach has a great infrastructure where you can rent chairs and umbrellas. From the Old Town, you can reach Banje Beach with a short walk from the Ploče Gate. Sv. Jakov Beach a bit further than Banje Beach. If you wanna reach this beach you have to pass Banje Beach and keep walking for about 20 minutes. If you feel like having a more adventurous day trip, and don’t mind going a bit further, you also can! There are a lot of other beaches around Dubrovnik with fewer tourists. You can reach some of the closest islands like Lokrum, Sipan or Lopud taking a boat trip from the Old Town Port. Or you can just walk around 15 minutes in the opposite direction from Banje Beach – from the Pile Gate – and you will also find lots of small bays. Doesn’t matter where you choose to dive in, know that you will find a stunningly beautiful and clean sea. By the way, the sea around Dubrovnik has been rated “excellent” by the European environmental regulators. Marzito Tip: If you are not a big fan of cold water, don’t worry! Dubrovnik Riviera, it’s among the warmest waters in Croatia with temperatures averaging about 25.5°C in August! Dubrovnik International Airport, near Čilipi, is approximately 20 km (+/- 30 minutes) from the city center. Buses connect the airport with the main bus station in Gruž. The best-known port of Dubrovnik is Gruž. It is there that most of the cruises that stop at the city dock. Gruž is approximately a 10-minute drive from the medieval town. So for those who arrive in the city by ship and only have a few hours to enjoy the city. It is worthwhile to schedule a private transfer to not waste time. But of course, if you prefer you can also find some taxi options at the port exit. Just remember that thousands of people will be landing at the same time, so you may have to wait until you get a free cab. Public transportation within Dubrovnik is super practical and safe. The city has a local bus network that connects all neighborhoods. It runs from morning until midnight. In addition to the buses, there are also taxi options and private transfers. With regards to arrival in Dubrovnik, a negative point is that it is impossible to reach the city by train. In this case, access is possible by sea, with ferry and catamaran, bus, car and private transfer. As the area around the city is disconnected from the rest of the Croatian territory, you need to leave the country for a short time. Enter Neum in Bosnia and Herzegovina, leave and then enter Croatia again and continue to Dubrovnik. This is why I highly recommend if you decide to travel to Croatia and region by car on your own, to rent a GPS. Driving in Croatia is super safe and the roads are great. But as countries have borders, sometimes imperceptible, getting lost and getting off the route is also very easy. Dubrovnik has a prime location so it is possible to do several day trips around the area. Dubrovnik – Bay of Kotor – Dubrovnik. 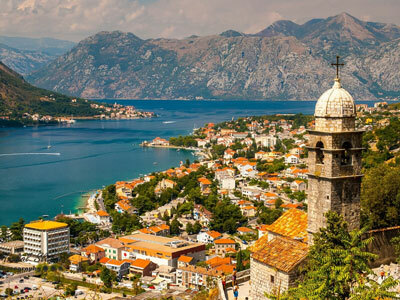 Enjoy the opportunity to visit another country in the Adriatic Sea, Montenegro! It is a very nice country and it is possible to go and back on the same day. Dubrovnik – Mostar – Dubrovnik. In addition to Montenegro, you can also visit Bosnia and Herzegovina on a day trip. 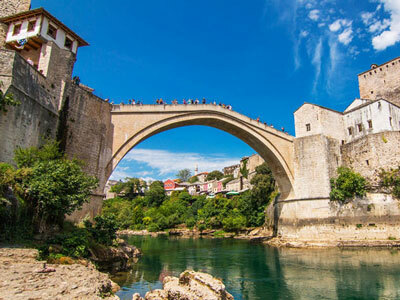 In Mostar, you will get to know the most iconic bridge in this country so rich in history. Enjoy to learn more about a different culture and experience the culinary delights of Bosnia! Dubrovnik – Island of Korcula – Dubrovnik. 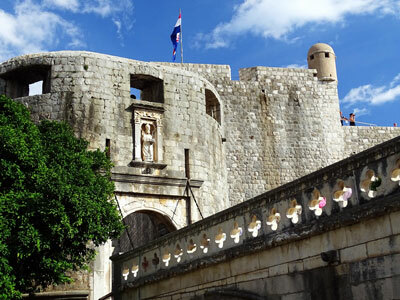 Besides strolling in Dubrovnik, you can also use your time to visit Korcula. The island where Marco Polo was born. Dubrovnik – Island of Lokrum – Dubrovnik. Another cool destination for nature lovers. The island of Lokrum is an environmental reserve just a few minutes by boat from Dubrovnik. The island offers some options for hiking trails and swimming possibilities. Dubrovnik – wineries – Dubrovnik. The region of old Ragusa/Dubrovnik is super famous for the wineries. If you have time, be sure to visit one of them and taste some of the best national wines. Dubrovnik – Mljet National Park – Dubrovnik. Croatia is well known for its stunning nature. If you are only in the Dubrovnik region and won’t be able to visit Plitvice Lakes National Park. Or Krka National Park. Enjoy the opportunity to visit Mljet National Park. Dubrovnik – Hvar. This is not a day trip, but with catamaran is possible to reach Hvar Island. 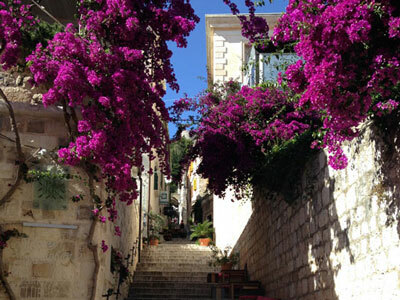 You can make Hvar – Dubrovnik or Dubrovnik – Hvar. The companies that make this route are Jadrolinja and Krilo. The scheduling options are few, and most common during the summer.